It is amazing to understand how we speak and understand other people’s speech. Our minds are elaborately organised and engineered for language processing and to be able to function for this skill of communication we need to have somewhere to store our words in our mind. Efficient storage of words is important for great receptive and expressive language skills. 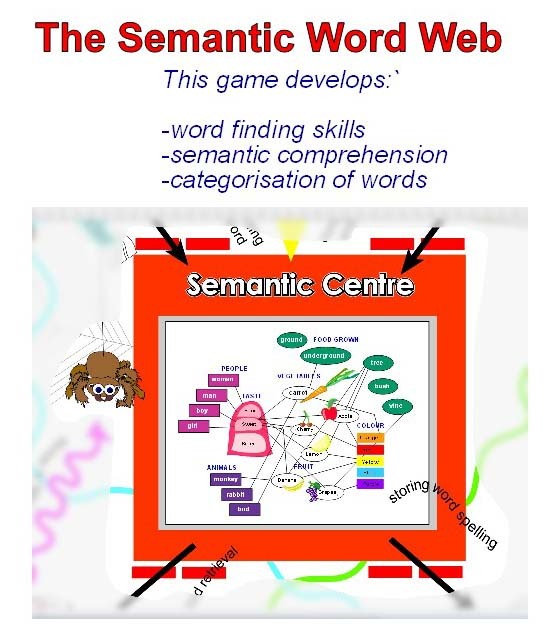 We store these words in a place we call the semantic centre which works like a well organised shopping centre full of words stacked in aisles to the roof. 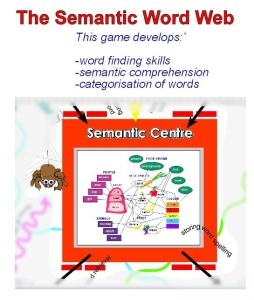 We could also say that this semantic centre was like a giant WORD SPIDER WEB of vocabulary and concepts that are all linked in relation to the words meaning, the words definitions and then how they are related to each other in the semantic system. The words are also stored based on the sound string (phonological) information of the word (eg. Flower-florist-floppy-fly). This becomes clear when working as a Speech Pathologist who have language and word retrieval problems after a stroke and a brain injury. It is quite intere3sting to hear the word errors that these individuals say that are either semantic errors (mixed for close meaning eg. Table-chair) or phonemic errors (mixed for their sounds-eg. I drive a carrot). Auditory memory-in remembering the words that have been said. Watch the training video where Katrine Elliott (Speech Pathologist) gives you instructions about how to play the game with your family or at school in a group of friends. She will also give you some information about language and how the semantic system operates within our entire communication system. Watch out for the “How to fix…speech-listening-language-reading-spelling and writing” series to learn more about great information to help your child with their speech therapy program to develop their speech, language and literacy skills.